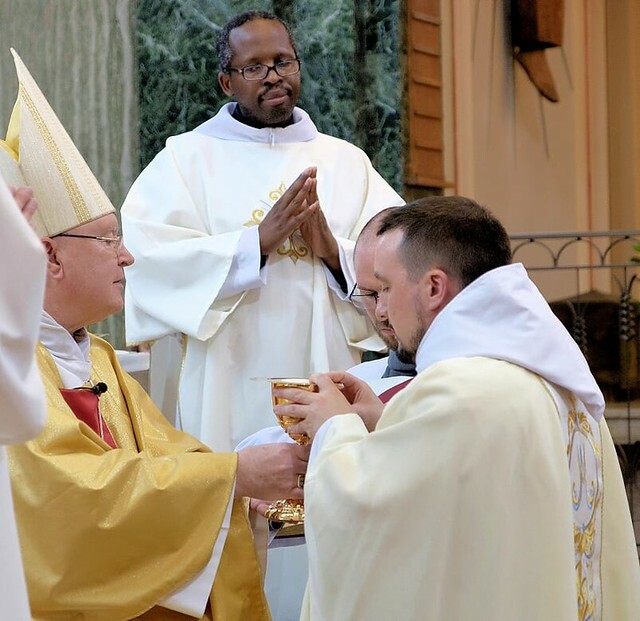 Earlier this month Fr Gerard Mary Toman, a Conventual Franciscan, was ordained a priest at the Church of the Precious Blood and All Souls in Coventry. Having entered the Conventual Franciscans as a postulant nine years ago, it was a great joy for him to be ordained in his home parish. The ordination on July 6 was a blessed and prayerful occasion, and in attendance were members of his family, his religious order along with many other priests, consecrated religious, parishioners and friends. Bishop William Kenney was the ordaining bishop, and his homily centred around the need for priests to be men who truly love and serve others. Fr Michael Brandon - with the help of many generous volunteers - helped to organise the refreshments afterwards, which included a hog roast and marques of food and drink, all of which were enjoyed in the beautifully planned parish garden. It was a day of great celebration, thanksgiving and much joy. Fr Gerard Mary has now been assigned to the refounded Conventual Franciscan friary in Walsingham. The Conventual Franciscans were recently invited back to Walsingham, 480 years after their first friary was suppressed under Henry VIII. Fr Gerard Mary will live in a community of friars, where he will serve as one of the chaplains to National Shrine of Our Lady of Walsingham. Please pray for Fr Gerard Mary as he begins his life as a priest, and please pray for all those who were involved in making his ordination such a beautiful and memorable day.